The 2017 Dubai Motor Show is in full swing, and McLaren has chosen this opportunity to unveil the latest creation from its bespoke division, MSO (McLaren Special Operations). 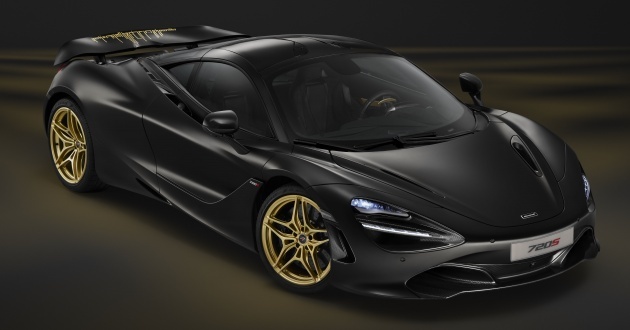 Based on the new 720S, the company says personalising the car added more than 120 hours to the production process. To create the desired visual impact of the gold lettering, custom stencils produced by the MSO design visualisation team had to be used. Other highlights of the exterior include the car’s gold-painted alloy wheels and various carbon-fibre components like the rear diffuser, roof panel and front splitter, among others. An item that isn’t painted gold, but is actually made of the stuff, is the 24-carat gold engine heatshield (reminiscent of the F1). To ensure the gold bits really stand out, the car gets a Zenith Black paintjob with a satin finish. The gold theme continues on the inside, as seen on specific interior components. The rest of the cabin receives black Alcantara and leather trim, along with a regular carbon-fibre interior upgrade pack. A plaque on the left side of the cabin identifies it as a ‘1 of 1’ MSO commission. No change to the mechanicals, with the 4.0 litre twin-turbo V8 continuing to serve up 720 PS at 7,500 rpm and 770 Nm of torque at 5,500 rpm. All that power is sent to the rear wheels via a seven-speed dual-clutch SSG gearbox, and the 720S will complete the century sprint in just 2.9 seconds.